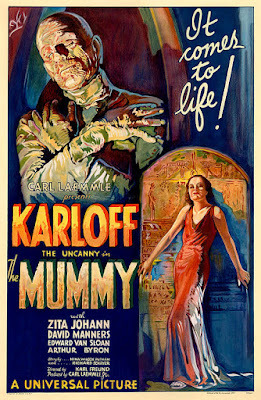 Today, I'm all wrapped up in the horror classic, The Mummy (1932), starring Boris Karloff. 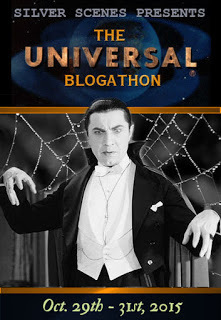 This article is part of the Universal Pictures Blogathon hosted by Silver Scenes. Universal Pictures made many exceptional horror films during the 1930's. The Mummy (1932), directed by the great cinematographer Karl Freund, stands out among these great films for its unparalleled ability to scare audiences through atmosphere. Freund expertly crafts several chilling scenes using only light and shadow, sound effects, and pieces of dirty linen gliding across the floor. The Mummy tells the story of Imhotep (Boris Karloff), an ancient Egyptian priest who was buried alive for offending the gods. In 1921, a British explorer (Arthur Byron) uncovers his tomb, and, with the help of an ancient incantation, Imhotep rises from the dead. He then begins a quest to reignite his 3,700 year old flame for Princess Ankh-es-en-Amon, who may be reincarnated in the form of a lovely young woman (Zita Johann). The Mummy was the brainchild of Universal chief Carl Laemmle. The studio made tons of money with Frankenstein (1931) and Dracula (1931), and Laemmle wanted to keep the horror fans flocking to theaters with a new monster that came from ancient Egypt. The discovery of the Pharaoh Tutankhamen's tomb in 1923 was a media sensation that sparked a revival of interest in all things Egyptian, especially after "the curse of King Tut's tomb" allegedly caused the mysterious deaths of several expedition members (some of the reputed victims of the curse are expedition leader Lord Carnarvon, who died of blood poisoning caused by nicking his skin while shaving, and Carnarvon's half-brother, Aubrey Herbert, who went blind and then mysteriously expired during a dental procedure). Screenwriters Nina Wilcox Putnam, Richard Schayer, and John Balderston crafted a chilling screenplay that combines some elements of ancient Egyptian religion and facts about the 1923 expedition (Ankh-es-en-Amon was the real name of Tutankhamun's consort), but it is mostly creepy sounding gobbledy gook manufactured by Balderston. He wrote the supposedly ancient spell in the scroll of Thoth ("O Amon-Ra!, O god of gods!"). Laemmle re-teamed several horror veterans for The Mummy. Freund, who was the cinematographer on Dracula, was hired to direct two days before the start of shooting, and another Dracula veteran, Edward Van Sloan who was so memorable as Van Helsing, took the part of mummy hunter Dr. Muller. Karloff was already a horror icon for his role in Frankenstein, but The Mummy required him to endure even more than he had as the mad scientist's monster. Legendary make-up artist Jack Pierce created all of the iconic looks for Universal's monsters, but he often said his best work was in The Mummy. Karloff had relatively minimal make-up for most of the movie, but the opening scene, where Imhotep rises from an ancient tomb, required Karloff to appear as if he had been wrapped in bandages for centuries. Pierce used a combination of cotton, collodion, (a plaster of Paris-like mixture), spirit gum, and linen bandages to create the effect of a 3,700 year old mummy. Karloff later remembered The Mummy make-up as, "the most trying ordeal I ever endured." It took 8 hours to put on Karloff's make-up before he could start working. He then worked until 2 a.m. to shoot the scene and afterwards spent another painful two hours removing the costume. 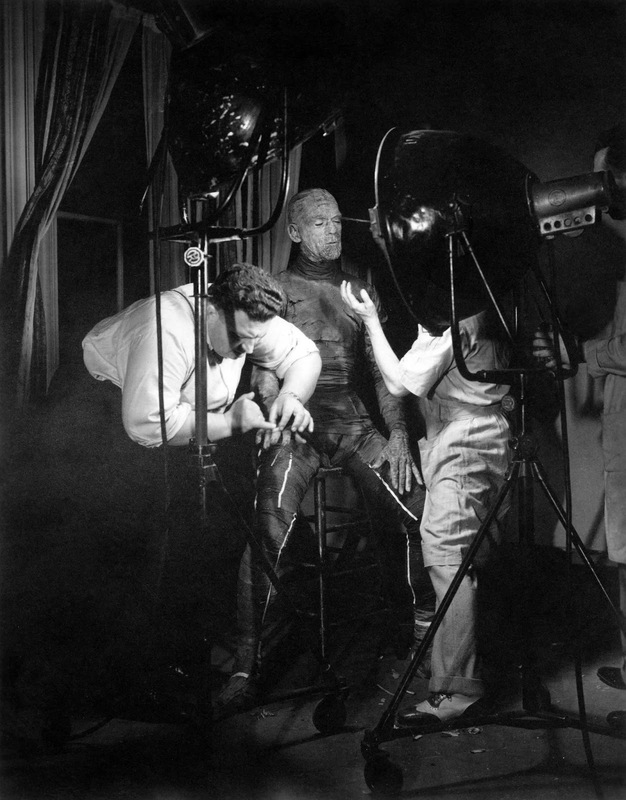 Boris Karloff gets his elaborate makeup tweaked on the set of The Mummy (1932). 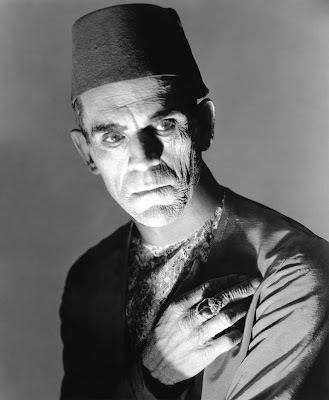 Even though Karloff didn't have a pleasant experience on The Mummy, the film greatly benefits from his performance. Horror actors are often overlooked, but Karloff is simply brilliant as Imhotep. He has the advantage of using his imposing baritone voice (he was speechless in Frankenstein) to intone lines like "my love has lasted longer than the temples of our gods," but he also uses his whole body to convey the impression of someone who is both extremely dignified and very ancient. The Mummy also benefits from the efficient and inventive direction of Freund. Laemmle wasn't exactly giving directors huge budgets for these movies, so Freund had to create horror by using lighting, camera angles, and sound. The opening scene is, in my opinion, the single best scene in the entire Universal horror catalogue. It is simply a triumph of Freund's technical skills that creates terror with a withered hand, linen bandages and piercing screams (clip below). Since 1932, the Mummy has continued to be a popular Universal monster. 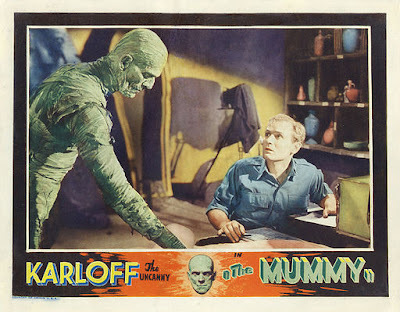 The studio made a series of popular Mummy movies in the 1940's (visit Classic Film and TV Cafe for more on those films), and Hammer Films also produced a series of Mummy movies in the 1950's and 1960's. Universal Studios successfully rebooted the franchise in 1999 with six successful films and a cartoon series, and there is supposedly another remake on the way in 2017. Still, there's nothing like curling up on a cold autumn evening to watch the original, which is still one of the best horror movies from the legendary Universal Pictures. The Mummy is available on DVD, Blu-ray and video on demand. Click here for articles from past blogathons. I really want to see this! I greatly enjoyed the 1999 version but can't find a copy of this one to watch. I hope TCM shows it soon! This was a hard one to find for me, too. There weren't even many libraries in Ohio that had a copy. Grand piece on one of my all-time favourites. Great haiku. It really captures the pathos in Karloff's character. Thanks. You have put me in the mood to spend time with Im-Ho-Tep this evening.